A masters of occupational therapy degree online or on campus allows graduates to find employment through which they are able to help people with various impairments improve their ability to perform everyday tasks. An occupational therapist can work with individuals that have a mental, physical, developmental, or emotionally debilitating condition. Treatment is provided to help people recover, develop, and maintain work and living skills. The goal is to allow patients to lead an independent and productive life. More details of the programs leading to an occupational therapist career are provided on this page. You might also like to check out the occupational therapist programs on the About Health Degrees web site. What does an occupational therapy program cover? A graduate of an occupational therapy masters program can help a client perform a range of activities, for example using a computer, stove, or assisting with dressing and bathing. Depending upon the affliction, physical exercises can be required to help improve a patient’s dexterity or strength, or other activities may be required to develop learning skills. Those individuals that have permanent disabilities, perhaps to the spinal cord or brain, can often need more advanced and specialized instruction to help maintain a basic standard of living. A therapist working with such clients would need to be familiar with the use of special equipment such as mobility devices, dressing aids, and eating aids. The curriculum of a masters program of occupational therapy can include biological, behavioural, and physical sciences, and also topics relating to the correct application of the latest theories and concepts. An accredited program would include a minimum of twenty four weeks of placement training as part of the syllabus. Those people interested in taking up this profession should have achieved excellence in disciplines such as chemistry, health science, anatomy, social science and biology. Admissions officers would look more variably on applicants that have experience in a healthcare field. 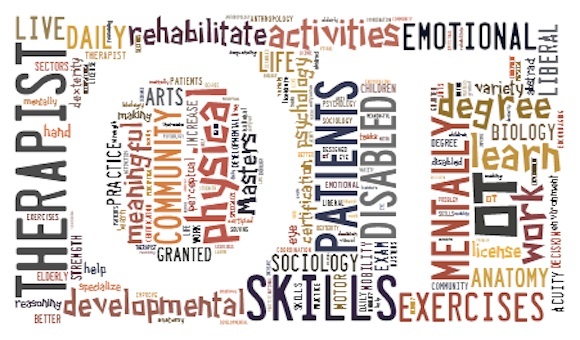 What is required for occupational therapist certification? To find employment in this field, it is necessary to acquire an occupational therapist license. To achieve this, an applicant must have completed the necessary course of study and sat a national certification exam. The actual requirements vary from state to state, but usually you are required to hold a masters degree from a recognized school or college. Also, it is stipulated that an occupational therapist must have attended a course that has received accreditation from the ACOTE, the Accreditation Council for Occupational Therapy Education. What are the career prospects with a masters? As of 2009, more than 100,000 people were employed in this field in the US. The greatest number of positions were in ambulatory health care services. Other employers include educational services, nursing care facilities, hospitals, and government agencies. Occupational therapist employment is predicted to grow faster than most sectors. This is in part due to the switch to a more elderly demographic in the country. Figures from the US Bureau of Labor Statistics suggest a growth of 26% in the coming decade.